Gift cards can be an effective way to increase online sales, acquire new customers, and encourage return visits. Marketing gift cards can be easy during holidays, like Valentine’s Day, Mother’s Day, and, most of all, Christmas. About 81 percent of American adults will purchase at least one gift card during the holiday season according to data from a November 2012 National Retail Federation survey. This makes gift cards — as a category — some of the most popular Christmas presents of all. What’s more, a shopper using a gift card to make a purchase will likely spend 40 percent more than the value of the card, according to Shopatron, an ecommerce platform. In addition, Shopatron reported that 41 percent of gift card recipients will visit a new store because of a gift card and that 72 percent of gift card recipients would make a return trip to the store. Gift cards, even discounted ones, may also contribute to margins. A 2009 study from payment processing firm First Data found that 31 percent of gift card recipients were more likely to purchase full price items than were shoppers using other forms of payments. Effectively, when shopping with a gift card price is less important. Given these various pieces of data about how effective gift cards may be, it makes sense to consider offering gift cards online. Gift cards, even ones redeemable online, come in two basic formats: a physical payment-card-like gift card and an electronic gift card number. Physical gift cards, which are shipped to shoppers like any other physical item purchased, can cost as much as $1.00 each to have printed, die cut, and otherwise prepared. But they are also more substantial, if you will, when dropped in an envelope and, in some ways, easier to market. Electronic gift cards can be printed out repeatedly, don’t cost the merchant anything to produce, and may be emailed immediately to recipients. But for some shoppers they will seem less substantial than a physical gift card and may not be as attractive a gift. Online sellers using gift cards should always offer an electronic version of the card, whereas offering physical cards will be a choice dependent on capital, marketing goals, and other business considerations. Importantly, remember that gift cards are regulated at the state level so that how one markets a gift card in Idaho may be different from California. Be certain to check state laws for each jurisdiction in which your business has legal nexus. Also, almost no jurisdiction will allow a gift card to expire. One common approach is to simply market gift cards at a discount. As an example, buy a $50 gift card for $45. Gift givers get a deal, encouraging them to purchase the gift card, while the recipient gets some extra value. The discount may also be used to move shoppers up a denomination. For example, when shoppers add a $20 gift card to an online shopping cart, the platform might offer them a $30 gift card for just $25. Some shoppers will spend the additional $5. Just be careful, as with any discount, this approach does hurt profit margins. A delayed and discounted gift card is typically aimed at moving a sale from, say, just before Christmas to a slower time of the year, like January. This approach can also be used to prevent immediate redemptions. As an example, sometimes when merchants offer discounted gift cards as described above, shoppers will purchase those cards in one transaction, but then use them moments later to purchase other items on the site. This defeats some of the benefits of promoting gift cards. In the discounted and delayed scenario, the shopper buys a discounted gift card, but the recipient either may not use the card until after a specified date or may not receive the additional value until after a specified date. Here is an example. Assume a shopper purchases a $50 gift card for $40 on December 10, but the card itself may not be used for a purchase until after January 1. Similarly, a shopper could purchase a $50 gift card for $50, with the promise that if the card’s balance is still $50 on January 1, the merchant will add an additional $10 to the card’s balance, but if the card’s value drops below the $50 threshold before the first of the year, the additional dollars are not awarded. In each case the shopper or recipient gets additional card value for being patient. Some shoppers make buying choices with their social conscience. A good example of this can be seen with Toms, a shoe and eyeglass retailer that gives needy folks a pair of shoes or eyeglasses for every pair Toms sells. 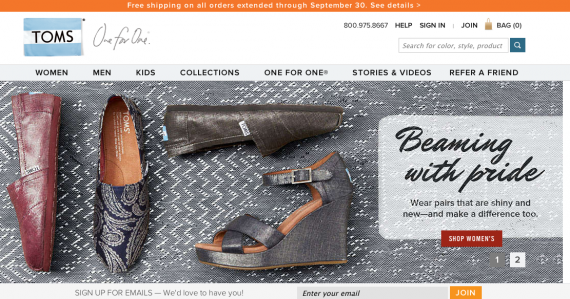 Toms links social conscience with retailing. The same concept can apply to offering online gift cards. Something similar can be done with gift card marketing. For every $50 of gift card purchases, offer to give $5 to a good cause in the shopper’s or recipient’s name. For example, a merchant that sells hunting gear might offer to give $10 to Duck’s Unlimited for every $100 gift card purchased. Or a purveyor of farm products might offer to donate a $10 share of a goat via Heifer International, a charitable organization, for every $100 gift card purchased. Frequently, charitable organizations will even help merchants that make donation offers, sending emails to members or interested folks or posting information about the gift card offer on the organization’s own blog. Kickback gift card promotions give money, in the form of a second gift card, back to the giver as a reward for buying the gift card. A store, for example, could offer a $10 kickback for every $100 in gift card purchases. When a holiday shopper buys a $100 gift card in December, the $10 kickback card arrives via email or postal service in January. Online stores, even relatively small ones, can also sell physical gift cards at other retailers’ stores. To see this in action, visit just about any grocery store in the United States. Near the checkout, you will likely find gift cards from merchants, even pure play online merchants, available for purchase. Small retailers can start by contacting local or regional chains to learn if they would be interested in selling gift cards. Often, however, the grocery retailer promoting your cards will take most of the margin. Gift cards may also be marketed to schools or other charitable organizations as fundraisers. In a typical example, the organization buys gift cards at a discount, perhaps, 20 percent below face value. The merchant is paid up front, and the organization will sell the cards at face value or even at a 10 percent discount, keeping the difference.